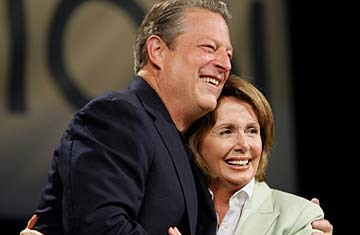 Former Vice President Al Gore and U.S. House Speaker Nancy Pelosi embrace at a meeting held by Netroots Nation Saturday, July 19, 2008, in Austin, Texas. Nancy Pelosi probably knew that the crowd was not going to be friendly. She may be the top Democrat on Capitol Hill, but on Saturday morning in Austin, Texas, she was the featured guest at a Question and Answer session at Netroots Nation, a yearly blogger conference organized by Daily Kos, the influential political blog founded by Markos Moulitsas. These liberals have not been happy with the Speaker of the House's recent decision to table the issue of impeaching George Bush in Congress. Criticism of her appearance in the blogosphere had been so high in the lead-up to the event that Gina Cooper, an event moderator, preceded her introduction of the Speaker with a warning against any agitation. For Pelosi, the potential for trouble at her Q&A session at the Austin Convention Center was everywhere. Codepink, an anti-war group organized by women, had its activists, some clad with pink spandex, capes and masks, lined up in front of the entrance, chanting slogans about impeachment. Several members of the audience, which numbered about 2,000, stood, waving copies of the U.S. Constitution in the air. When Pelosi was finally introduced, she was greeted with a standing ovation. She jokingly said she hoped the applause would establish the tone for the Q&A. Her statement that "If you don't like abortion, you should love contraception" was met with enthusiastic applause, as did her support of net neutrality  equal, unrestricted access to the Internet  an issue close to the hearts of the bloggers. Other remarks, however, garnered mixed, if not outright hostile, reactions. One audience member screamed for her to "answer the question" about Democratic action on the FISA bill. She ignored that interruption. Others drew hushes from the crowd. But Pelosi had an ace up her sleeve  or in her bag. Just as the audience began to get fidgety, she began to talk about climate issues, and pulled her cell phone out of her purse. The moderator asked if Pelosi was "pulling a Giuliani." In fact, one-upping Rudy Giuliani's now-famous cell-phone call from his wife during a high-profile speech, Pelosi explained that she had a letter from a friend, an expert on the issue. Placing her phone to the microphone, Vice President Al Gore's voice began to narrate a climate-change plea for action. And then, as his voice continued to pour out of the phone, Gore appeared on stage. The audience exploded into a minute-long standing ovation. Gore continued his call for action on the issue of climate change and he praised the Netroots community, saying, "It is important that we will have well-informed citizenry that is involved, engaged, and will be a part. You are doing just that." He added: "You will remember coming here to reclaim the integrity of democracy." That sparked one of four standing ovations for the former Vice President. Nevertheless, Codepink protesters started chanting for impeachment again before swaggering toward the exit, escorted at that point by staffers who made sure they left the premises. Gore then suggested that Pelosi was one of the best leaders in the history of the Congress, a sentiment that received unanimous applause, the naysayers no longer being present. The original version of this story said that Hillary Clinton's appearance at a 2007 Netroots Q&A session was greeted by boos. The writer confused that event with accounts of another Clinton appearance that had taken place earlier. Clinton was not booed at the Netroots event.